WHAT’S WITH PHOTOGRAPHERS AND OLD DOORS? There are certain subjects that the practitioners of photography as art just can’t walk by—and old doors are near the top of the list. The older the better. They… O.K. we—can’t resist the pealing paint or hand caved varieties in particular. Old wood, barn wood or anything made from barn wood. Leaning or tilting barns, buildings, outhouses, headstones or crosses—anything. Leaning or tilting. Old windows—see pealing paint/hand carved—hand made glass preferable with broken panes; tattered drapes a bonus. Rusting tractors, old cars, guns, tools, bridges, baby carriages—anything rusting. Wheels—old, rusting, wooden, wagon wheels with remnants of pealing paint and we’re golden! Now you now why you can’t keep photographers out of ghost towns. Everything on the list can be found in a good ghost town. It’s Disneyland for photographers! 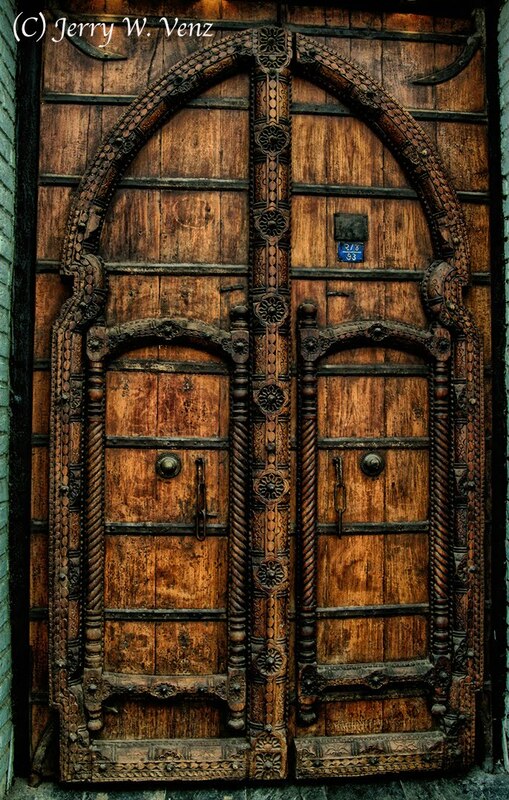 If you want to find some nice old doors it’s hard to beat Italy. This 2nd floor pealing beauty to no where was on the Isle of Capri. The bottom line on my list is OLD and if you want to find old Italy ( and the European continent ) is hard to beat. It seems that the youngest thing in Italy is four times older than the oldest thing in the USA by comparison. Old gnarled trees like the Bristlecone or Jeffery Pine. I guess the ultimate would be the petrified forrest—of course anything petrified! Natural Arches, Pillars, hoodoos, goblins, post piles, windows or waves. Canyons (Grand or slot) to caves and anything there-in. Another of my favorite old doors…. I found this hand carved masterpiece in Puerto Vallarta, Mexico. So, what is it with us photographers and old doors? To be sure we are suckers for anything old. I think it has a lot to do with the patina of age. Time and weather create marvelous textures on wood and metal (rust) that can’t be found in modern materials as they age. Even with dramatic lighting there’s not the same artistic interest in weathered plastic, carbon fiber or stainless steel. Modern materials do not age gracefully, they just tend to disintegrate. 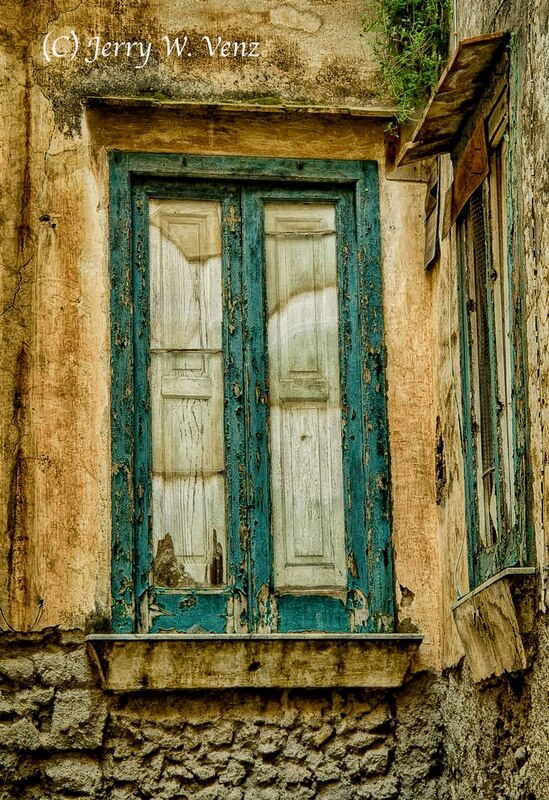 Old doors are special, they can exhibit the things we look for in old man made objects like rusting hardware, layers of pealing paint and sometimes superb craftsmanship. But they offer more than their appearance. They entice us with an unknown story; who made it, why did they put so much effort into it, and when found loose, what building was it attached to? Then when we photograph a great old door that’s installed on a building in use there’s always the mystery of who’s on the other side and what’s their story? Though we never knock to find those answers. We move on looking for the next treasure to photograph attaching the unsolved mystery to each door not unlike the metadata that describes each image we create. What’s on Your list of artistic subjects that are irresistible to you? 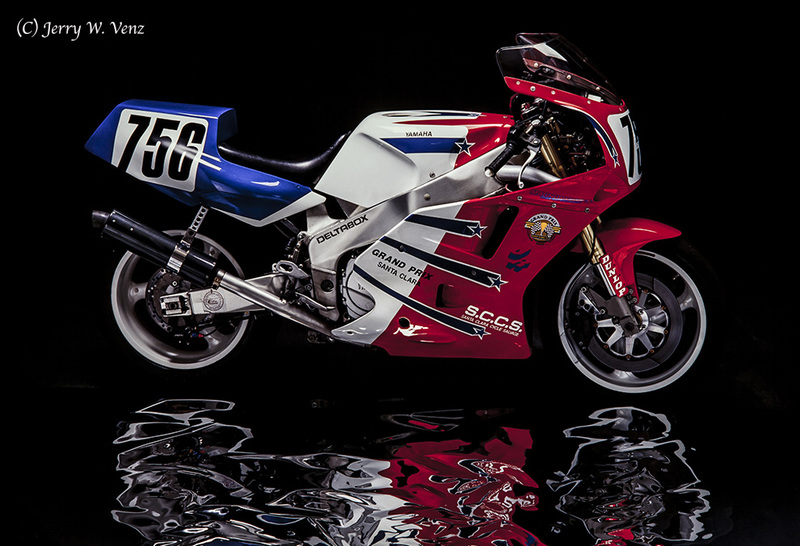 Studio photography of motorcycles is complex and time consuming. That’s why so many photographers would rather go on location outside and use natural light—I know I prefer that alternative! But, on occasion, I really like getting in the studio to do this kind of very technical, often problem solving, photography. I think the reason many of today’s photographers do much of their photography outside is that they don’t want to invest in a studio lighting kit, backgrounds, and all the many studio support tools needed to build a studio. Of course, then, they have to learn how to use all this equipment! That’s probably the biggest sticking point today. 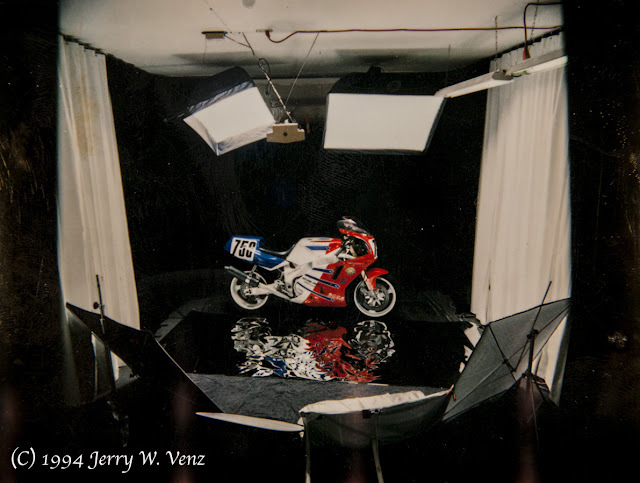 What I’m going to share in this blog is how I did motorcycle studio photography back before digital (on film! ) and on a budget before I had the multiple sets of studio lights I have today. So, flashing back to 1994…. The Polaroid back on my RB-67 is what made studio photography possible before digital. Note: This only applied to Technical studio work. We never “pulled Polaroids” when doing studio portraits of people—2-minutes was way too long to wait for the Polaroid to develop! As you can see I used two relatively small soft boxes, at the ceiling, mounted on either side of the garrage door opener (I had a garage studio back then too…) That ruled-out using one large soft box, as is customary today, which was fine since I didn’t own anything else! Now, the key to make this lighting set-up work was pointing both my main lights not directly at the motorcycle—but at my reflectors. I have the lights just skimming the top edges of the bike. Usually this meant my lights were angled at about 45 degrees towards the camera. This meant I needed to flag my lens to prevent flare from my lights. This image of my favorite all time bike the Kawasaki Ninja 900 (1984) was done on Kodak, EPZ, Ektachrome, 100X Pro using my Mama, 645 format, camera. The studio lighting was the same in this image. 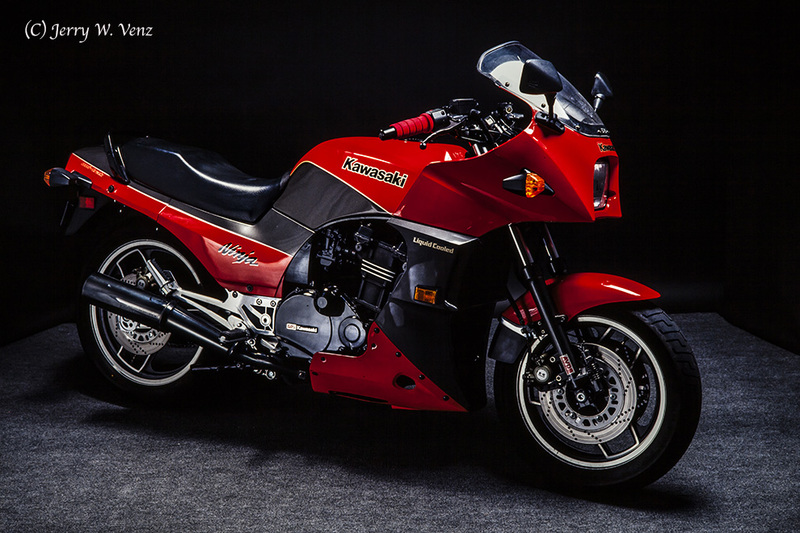 The most critical part here was getting my reflectors angled to reflect the lighting onto the front surface (the wheels, disk brakes and engine) of the bike. Hooray for Polaroids! The only thing that would have improved this image would have been edging the tires with talcum powder to create separation highlights, but I didn’t learn that trick until many years later. Another little trick I have learned along the way doing commercial photography is to dull shiny surfaces with hair spray. ’Til next week…have questions don’t hesitate to ask. Black and White portraits wether they are from street photography, studio or environmental portraits, or from such formal events as weddings, can import a powerful reality, a sense of importance, and a validity that we seem to trust more than a modern digital color image. There’s also the gravitas of the B&W medium as ART because of the painstaking “development” of the medium by its Masters in the 1920’s, 30’s and 40’s. I know that my photography only started to mature after several years of B&W print making, in home built darkrooms, beginning in 1970 and progressing well through the 1980’s. Because of this history I think it’s important that we be very selective about the images we choose to convert to B&W. Too many photographers, it appears today, just pick their failed color images and desaturate them in a last resort attempt to save the image. I often see the results of these attempts at B&W on several online monochrome Monday sites, and too often that’s exactly what the images are…monochrome; No blacks, No whites, just shades of grey. Many appearing to be stuck in Zone V! If an image I pick for B&W conversion does not have something in Zone II, for a good black, and Zone VII, for a nice white, in addition to those supporting greys, then it stays in color. Without the Blacks and Whites in an image there is no power or impact created by those contrasting values—it’s just monochrome. 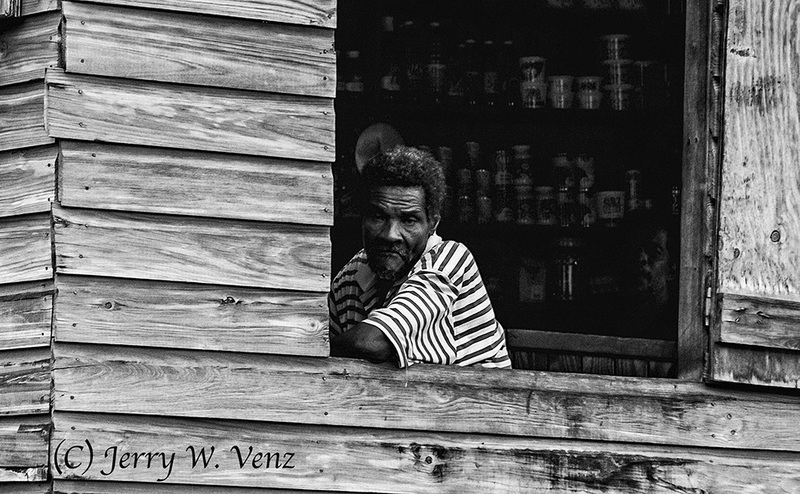 Taken in the streets, on the Island of Grenada, this image had all the Zones I wanted, but in color it was particularly flawed because the man’s shirt had red and white stripes. In my conversion I used Nick Silver Efex Pro-2 with some additional adjustments for stronger blacks. Most American weddings I’ve photographed did not have the necessary interest of texture or details to warrant B&W conversion. I’ve found these elements do exist in traditional ethnic weddings; my favorites being East Indian and Japanese. This image had all the elements I want for any portrait; color or B&W. I placed the bride at an open doorway creating that really nice directional lighting on her while the background had some incandescent lights dimly illuminating those large pots. 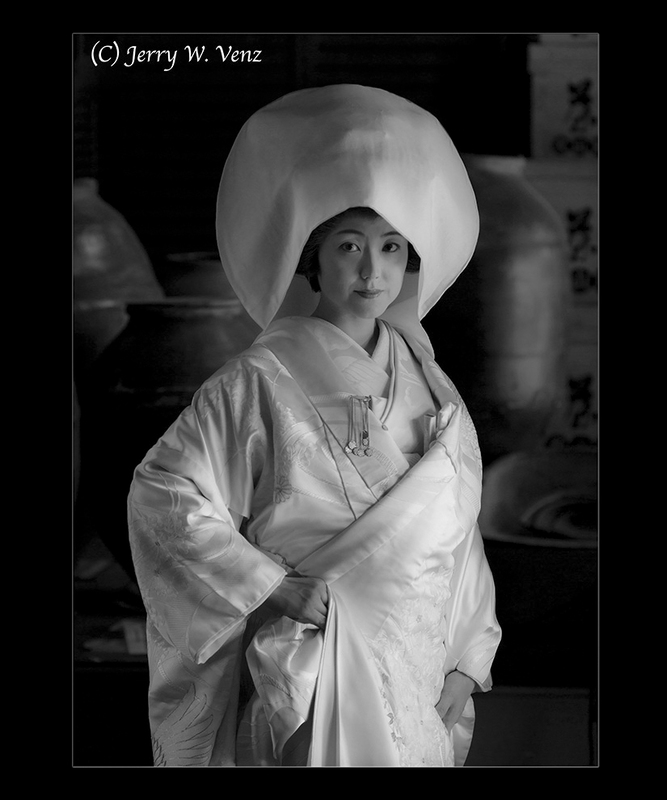 The color version of this was stunning, but by converting to B&W this portrait was pushed into the past looking like a period portrait since all the elements are authentic traditional Japanese. Using natural light that had direction because I placed the boy under an outside porch, this portrait needed to be B&W to simplify the composition. The background was a little too colorful even though I really knocked its focus out with the f4.5 aperture and my lens at 200mm. And worse was the red band on the boy’s hat—that had to go. 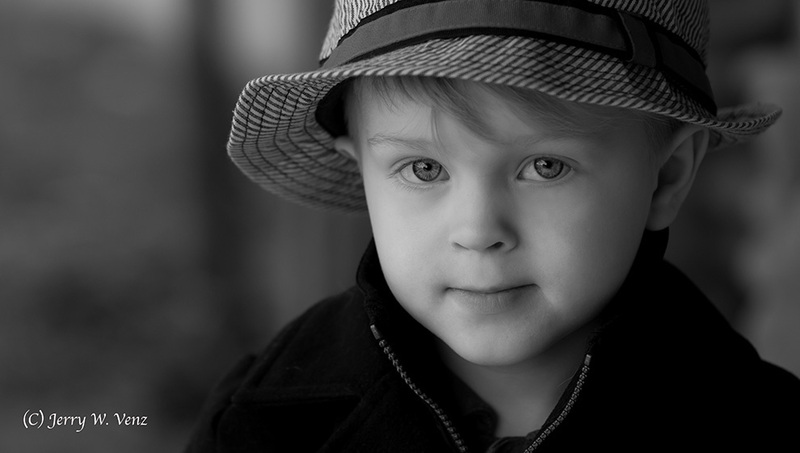 I think this portrait works very well in B&W; You now have nowhere else to look—being compelled by the boy’s eyes. So, be very selective with what color image you want to convert. Remember the goal is not merely monochrome; Look for the dramatic contrast in colors and/or lighting that will make good Blacks & Whites. ’Til next week…keep practicing and should you have questions don’t hesitate to ask. I didn’t get my first digital camera until late 2001 and even then I wasn’t about to integrate it into our photography business without a lot of testing and setting up a work flow. So, prior to that, any images I used for PPA (Professional Photographers of America) International Print Competition were from medium format 645 or 6x7 or 35mm film. However, my lab was Photoshop capable and I had many nice film images that, with some editing, I knew could do very well in print competition. Early 2001 was a very exciting time in my career because I was wrapping up my 5-year quest to earn my PPA Masters Degree. (Back then prints done in competition style were VERY expensive, not like today.) I only needed two more print competition merits to each my goal. I was also having a lot of fun using film and digital editing in a hybrid work-flow to create artistic images that, prior to Photoshop, I never imagined would be possible. 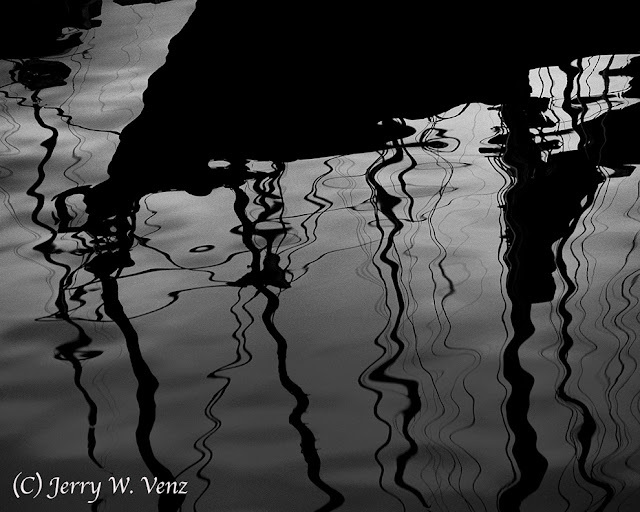 The original image on B&W film was taken in 1998 at the Monterey Yacht Harbor in California. It was only OK because I just didn’t like the grayness of the background created by the overcast sky. It needed punch….it needed color! So, I had my lab (Bay Photo Lab) simply overlay a color sunset gradient over the image, and darken the blacks to a pure silhouette. Today either my wife Kathi or I do all of the artwork here in the studio. The scanned final file was a 57.57 MB TIFF. When printed I had the lab flip the image upside down making the sail boat up-right. 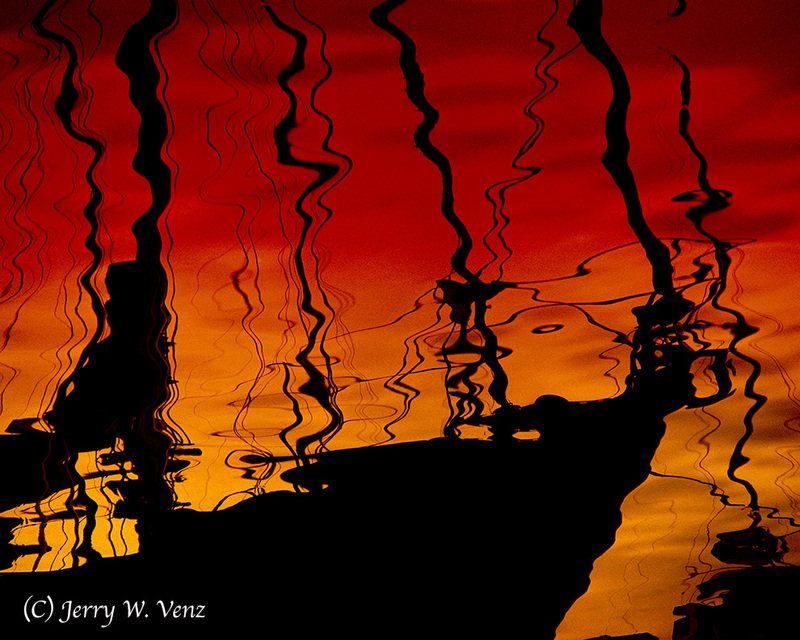 I titled the competition print “Red Sky at Night…Sailor’s Delight.” The title is important in PPA competitions. I think it was more meaningful getting my PPA Masters Degree at that time when our profession straddled both the film and digital mediums.